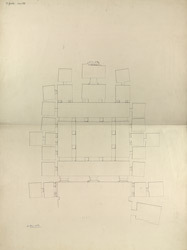 Plan of the Buddhist vihara, Cave XXI at Ajanta, from James Burgess' 'Original Drawings from the Buddhist Rock Temples at Ajanta.' The 30 magnificent cave temples are situated in a horse-shoe valley of the Waghora River in West India and consist of prayer halls (chaityas) and monasteries (viharas), built for the Buddhist community who lived there. The first group was excavated between the 2nd - 1st century BC. After a period of more than six centuries, the excavations restarted around the 5th century AD in the Vakataka period. Cave XXI is an incomplete monastery from the late 5th century. The verandah has lost its piers. Above the two pillars of the side shrines there are carvings of Hariti with attendants and a naga king. The door leading to the hall is richly ornamented.